I spent Memorial Day weekend in Sonoma County, CA, with my cousin Sarah and we got in a few great hikes. 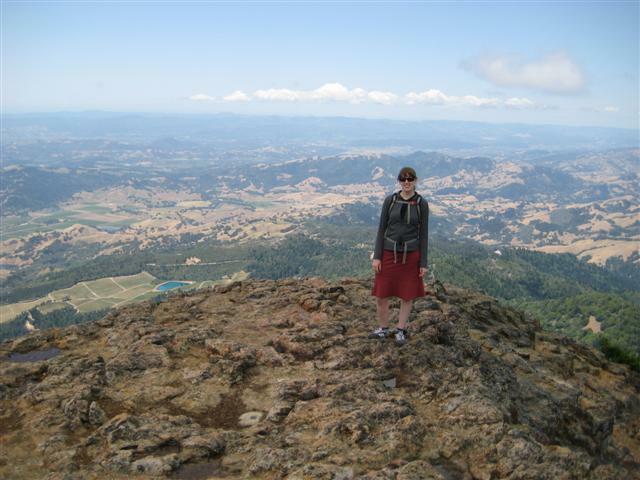 On Sunday we went to Robert Louis Stevenson State Park and climbed to the top of Mount St. Helena. It was about a ten mile hike, five out and five back. We started on the Stevenson Memorial Trail. Only the first mile of the trail was really trail-like and the rest of it was a fire road – not the most interesting thing to hike on but the views made up for it. We climbed over 2,000 feet to a 4,342 foot high summit where, with our backs to all the scenery-ruining radio towers, we had a delicious picnic lunch of fresh cherries and vegetable galettes. On the way down, we noticed paragliders and hang gliders setting up on a nearby peak so we walked over to watch them take off and ended up hanging out with them for over an hour. They invited us down to their landing zone but we already had an appointment with a mud bath to get to. We also saw some rock climbers on our way down the mountain. This morning we made our way on some very winding roads to Point Reyes National Seashore and the hike out to Tomales Point. This was again about a ten mile, five out and five back, route. The trail was through an elk reserve so we couldn’t stray off the narrow path. 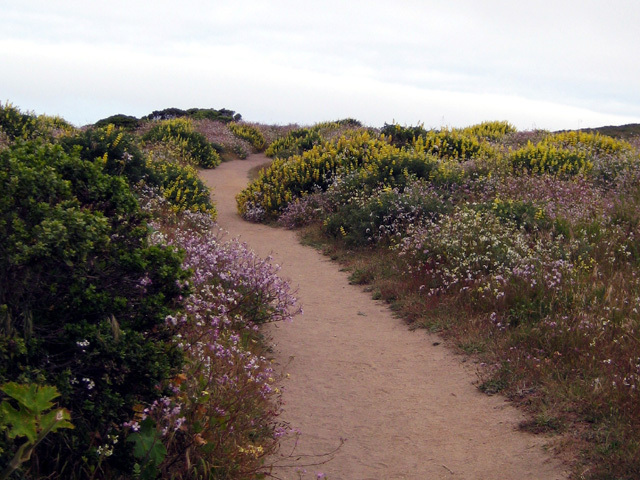 There were amazingly beautiful wildflowers all along the trail but especially towards the end of it, they got very overgrown and we had to push through them to stay on the trail. The rolling hills made it hard to see the northernmost point of the park we were heading towards and the scenery just kept getting better so towards the end of the trail I was practically skipping along with a big grin on my face to see what was coming up next, over the hill or around the bend. We got out to the point and climbed down to a little plateau for today’s picnic lunch, and then ran into a man hiking with his family for his 83rd birthday. I need to still be hiking at that age. It reminded me of the two older (70s at least) ladies my aunt and I ran into while hiking in Glacier National Park last May. They were the same speed as us or faster, on a just opened trail with still four to five feet of packed snow on half of it and lots of huge downed trees to climb over, and they apparently were in a hiking club that came to the park every week. 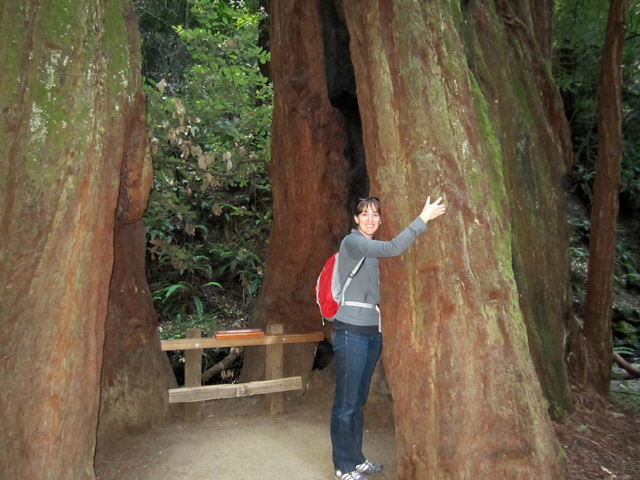 On our way back to the city, we stopped at Muir Woods National Monument to meet Keely, who was also out in San Francisco for work, and her boss, Catherine, for a short one mile hike through the giant trees. I would have loved to go out farther on their less accessible trails but there just wasn’t enough time after our long hike in the morning. Next time!